The 2nd Annual Massachusetts State Qualifier for USAT National Championship has been scheduled for March 10th, 2018 at Ashland High School, MA. If you plan on competing at the 2018 USAT National Championship, you MUST QUALIFY at a sanctioned state qualifier. 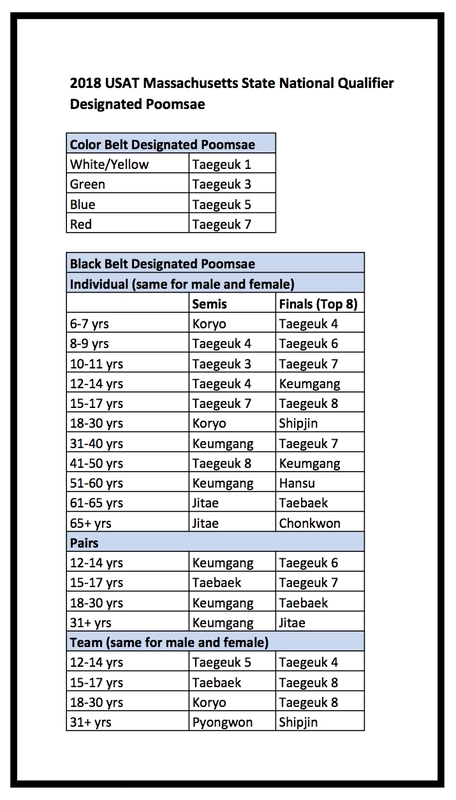 USA Taekwondo State Championships are direct qualifiers for the USA Taekwondo National Championships. All athletes must qualify at a sanctioned state qualifier each year to be eligible to compete at the USAT National Championship. All referees must be certified in order to referee at the USA Taekwondo sanctioned events. *$40.00 audit does not get certification or credit. To Audit: 1. Register for the seminar and select pay later; 2. send an email to referees@usa-taekwondo.us stating what seminar you are attending and that you want to audit.